Family First offers the safest and most reliable 24-hour medical alarm monitoring service that is currently available in the United States at the most competitive price for your family. Family First Medical Alarms customizes each one of our subscribers systems to meet your needs. Our customized systems provide more safety features and benefits than our competition with little to no additional costs to you. Our systems are pre-programmed, pre-wired (if we include remote speaker microphone bases), and pre-tested before they are shipped to you or your loved one for the absolute easiest self installation. See for yourself! We would also like to remind you that we allow our subscribers to cancel their service anytime (no penalty,) and we also return their money for the balance of the time that they do not use the service. The refund will go to the family member that you of course choose. You can see our actual payment agreement below the pictures of the equipment. Check our Order Page for Special Sale Pricing! Live two-way voice communication without handheld devices (such as telephones) 24 hours a day 7 days a week. Our standard system has a lead sealed 32 Hour Minimum/ 48 Hour Maximum hour backup battery in case of power failure. Programming that will let our equipment alert us immediately when AC power is restored to the residence. A reoccurring 30 day check in from the equipment reporting the proper codes and zones so that we know that each of our subscribers have equipment that is working properly, even if they do not test it weekly as we ask. "Database Customization" We will list as many contacts and telephone numbers that you feel the need to. Interchangeable emergency responding buttons that allow you to wear it on your neck or on your wrist. Pictured above are: Remotely located speaker/microphone units. If you are concerned that your loved one will not be able to hear our monitoring staff when they respond live, or be able to be heard through the standard medical alarm system, we have the ability to wire up to two remote speaker microphone units (pictured above without the wires.) There is a speaker and a sensitive microphone housed inside each one above. These microphones are much more sensitive than anything that can be purchased in a normal store. The units increase the hear and be heard radius in the home where the equipment is located. There is no additional charge for the units. There is small one time fee for the wires that have to be properly connected (the price is based on the amount that you need) The units come pre-wired and tested. All that you have to do is place the remote units in the room/s of your choice and conceal the wires so that there are no tripping hazards. The cost of the wires is $30.00 for every 50 feet that you request. #2 If there is no response from your loved one, our staff will immediately call the telephone number at the premises, if no one picks up the telephone to verify that everything is all right our staff will dispatch emergency service and then call the family and friends on the call list to let them know that their loved one has been transported to the hospital. Up to Eight Medication Reminders! All of the same great safety features of our standard medical alarm system with the ability to program up to eight separate medication reminders. We program the medication name and we also set the time of when each of the reminders alerts your loved one to take their medications. One Time Setup Fee programmed with your personal 4-digit security code! Please remember that there may be instances where your loved one activates their system and none of the emergency contacts on the call list are available. Although we offer to list a hidden key location on your loved ones account, many times the rescue services in your local town or city may not have the patience to locate it. The only way to ensure that damage will not be done (usually a window or door) when entering the home is to purchase a lockbox. We will program a four digit code of your choice into it and if a need to dispatch arises we will let them know what that code is. Remember to specify your choice of Door knob type or our less conspicuous Bracket type which is screwed into the location of your choice on the home itself. Family First will include additional emergency responding buttons that are gender programmed to be worn specifically by mom and specifically by dad. When your loved ones press their buttons, we know immediately which family member has depressed their button, as well as if their are different medical needs that each one may have based on the information that you give us prior to activating your account and shipping the equipment. Family First also uses the latest equipment that allows us to monitor the battery levels in the emergency responding buttons. We notify the specified contacts when we are mailing replacement responding buttons to our customers. (special note, batteries in the responding buttons are not replaceable due to the water tight seal.) There is no charge to you for any maintenance or upkeep of the equipment. Only $4.95 Extra per Month! These allow us to monitor the activity or lack of activity of your loved one in real time. We program the motion detectors on an 8, 12, or 24 hour basis. If our motion detectors do not sense movement from your loved one in the time specified, then one of our monitoring centers located here in the United States is alerted and we will then notify the contacts or emergency services as you choose. These are very popular with our shall we say, stubborn clients who like to take off their emergency responding buttons and not tell anyone then forget to wear their button. The smoke detectors allows us to dispatch emergency fire services and/or contact you or the people of your choice at the first detection of smoke. We monitor the battery levels in the smoke detectors real time, alert and ship the responsible contacts replacement batteries when they run low. Once again, we cover 100% the cost of the equipment upkeep while it is in your home. VERY IMPORTANT: Dead Telephone Line Filters! We are proud of our reputation for having the safest and most reliable medical monitoring system that is available across the United States. On top of our superior equipment, we are known for telling our customers everything that they need to do to make sure that they have done everything necessary for the equipment to function properly when their loved ones need to use it. Our standard equipment has the ability to restore "1" dead telephone line in the home. For those of you who are unsure as to what we mean, (at one time or another) we have all ended a telephone call with our parents and suddenly remembered that we have forgotten to mention something. Upon calling them back we have gotten a busy signal. Some of us have experienced that busy signal for hours. Some of us until the next day. We all know that our parents forgot to properly place the telephone on the cradle, and this caused the telephone line to go dead. In the instance where this happens and it was the telephone that is connected to our console base, our equipment will restore the telephone line and function properly. If your loved ones have other telephones in their home, and the scenario mentioned above should happen to one of the telephones that is not plugged into our console base, the service will not work. This is also true of all of our competition for that matter. The least expensive way to resolve this is to remove all of the telephones that are not connected to our console base. Of course, we all know that this may be a problem, that is why we offer patented "Dead Telephone Line Filters". They work on telephone line voltage and when they are plugged into the wall jacks prior to the other telephones, they allow our equipment to have seniority over all of the telephone lines in the home. There is a one time fee for each filter that is $20.00. In order for our medical alarm equipment to have seniority over all of the telephone lines, "Dead Telephone Line Filters" would need to be installed on all telephones that do not connect to the console base. Please remember that these are an optional item. Pictured above are: "Supervised Emergency Responding Buttons"
These Allow us to monitor if your loved one has traveled more than 300 feet from the home during a specified time period. (this is helpful for our customers who suffer from dementia and Alzheimer's Disease) Battery life is decreased dramatically when we program our emergency responding buttons and console base for this. We contact the responsible parties and replace the equipment at no charge upon the battery charge running low while it is in your home. We will ship your system the same day that we receive your order as long it is on or before 2:00PM Central Time Monday thru Friday and on or before 9:00AM on Saturdays. We will ship your system Express Next Day Delivery for the difference that it costs us to ship it Priority which is $19.95. You will receive the equipment on the day after you place your order (as long as you meet the time frames mentioned above) unless the area that we are shipping to is considered to be in a rural area by the United States Post Office. If that is the case the Post Office will only guarantee second day delivery. If you choose Express Next Day Mail, the difference of the $19.95 is applicable regardless if you receive the system on the next day or second day. We will contact you by the means that you specify (E-Mail, telephone, or both) to let you know exactly when you should be receiving you system when you pay for the difference to Express Next Day Mail the equipment. We offer the fastest and easiest way to cancel and return the Family First Medical Alarm! When you are ready to cancel your service. Take some padding, the medical alarm and button(s) to a US Post Office. Ask the Post Office for a FREE FLAT RATE BOX. The cost to return the medical alarm is only approximately $11.95. The month that the equipment is returned back to our office is the last month billed to your account and will equal your return for any unused balance of service. We will then refund the dollar amount for the unused balance (if applicable) to the person that you specify. We are one of the only companies that will allow you to cancel your service anytime without penalty, and we also refund you for the balance for the time that you did not use the service. We will match any of competitors monthly prices no matter how long you have been a subscriber. 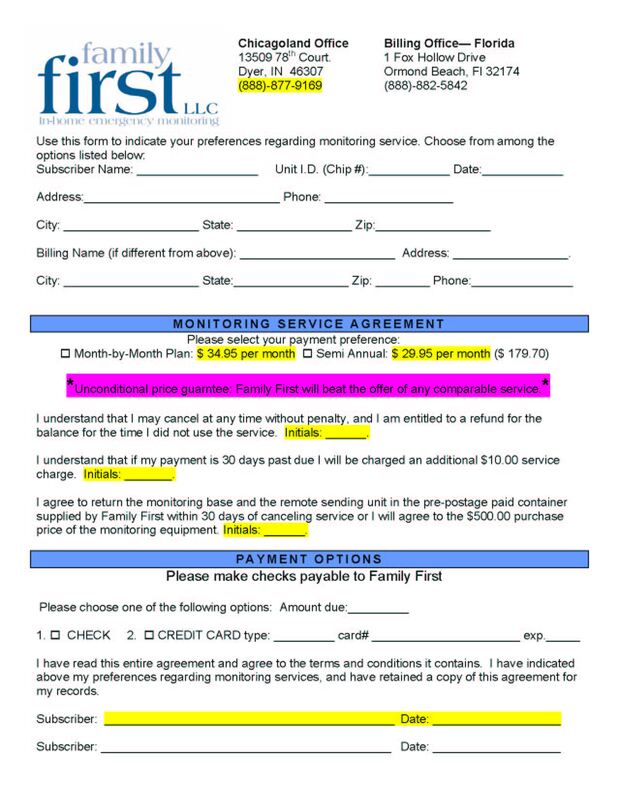 This ensures you that you will always be paying the most competitive monthly dollar amount for your monitoring. Please note, the competitors billing terms do apply. Cancel anytime without penalty, and receive a refund for the balance for the time that you do not use the service. Best of all find a better price and let us know! After you have finished gathering information from other companies like Family First, if you have found a more competitive price, give us a call and we will match their offer. This guarantee is also good even after you have become a subscriber. With Family First Medical Alarms you will always be paying the most competitive price for monthly monitoring.